Hey Bill, did you ever watch Storylords? I don’t know if I’ve ever told you this before, but when I was in the second grade, our teacher, Mrs. Cosgrove, she used to show us these educational videos every now and then. I’m sure teaching a bunch of little kids has got to be a physically and emotionally draining way to spend a day, so I don’t really begrudge the fact that she’d phone it in once in a while by turning on the TV and telling us to be quiet. But while everyone else would get all excited whenever the maintenance guy would knock on the door to wheel in one of the school’s TVs, my heart would stop. I went into school every single day with a pit in my stomach, a constant fear. Would today be the day? Because there wasn’t a schedule. It wasn’t like, “OK class, it’s 10:30 on Wednesday, so you know what that means, educational TV time.” No, it was just whenever the teacher felt like it. Sometimes we’d go months without so much as a spotting of a VHS tape. But then maybe we’d watch TV for two or three days in a row. I couldn’t rest. There was no escape from the fear. Every day had the potential to turn into a TV day without any warning. And it wasn’t the TV that I was afraid of, it was this one particular show that we had to watch. It was called Storylords. It was about this little kid around my age and his younger sister. 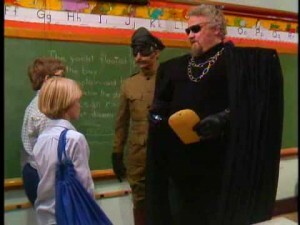 Each episode, they were visited by this wizard guy from another dimension. His world was overrun by this crazy warlord named Thorzul. Thorzul as a screen presence wasn’t that scary. It was really bad, cheap acting, just some guy in a black cape. He kind of looked like my dentist. But it was his character, this dictator of that other world, he had powers. He could turn people into stone. I’m not sure that it was a central part of the plot, I’m pretty sure the show was all about teaching kids how to read, but every episode, it’s like they didn’t have anything else to fall back on, and so he’d zap someone into a statue. And I was terrified. Like sitting there, sweating bullets, looking around at all my classmates, unable to understand how they were all just sitting there, smiling, watching TV, all while I was trying my best to keep it together, to not freak out and start screaming, terrified. And yeah, they always got it right, and then not only would they be spared an eternal hell, a life trapped in living stone, but the other statues would usually be restored back to life also. But man, for whatever reason, the idea of it, of being forced to ace a pop quiz, the pressure of getting it wrong, of feeling my insides harden as my skin turned grey. And what would it look like? What would be the last thing I’d see before my eyes cemented over? Would I be dead? Or just trapped forever? I’d barely make it through each episode, just quivering in my seat, hands clenched tightly around the sides of my desk, unable to shake that feeling of having just been mentally violated. What was the point of these videos? Why was my school trying to reinforce my already pretty decent reading and writing skills by terrorizing me into never making any mistakes? And so that’s what most of my year was like, just praying that it wouldn’t be a TV day, that I wouldn’t have to watch Storylords. But it always happened, maybe not immediately, but eventually, there’d be a knock at the door, everyone would get all excited, the maintenance guy would drag in that set, an old fashioned box mounted on top of a rolling dolly. It all came to a head one day midyear, Mrs. Cosgrove popped in the Storylords VHS, and instead of the usual introductory exposition, this particular episode skipped straight to the terror. At this point I couldn’t take it anymore. I broke down and started screaming, running out of the classroom and straight into the boys’ restroom. Crouched in the corner with my hands covering my eyes, I tried to get myself together, to stop myself from crying at least, hoping that nobody had seen where I’d run. But of course they knew where to look. And it was a huge deal. Mrs. Cosgrove was like, “What’s wrong with you?” completely unable to make the connection between Thorzul’s wrath and my little episode. They took me to the principal’s, my mom was called in. I remember sitting there in the office while my mom and Mrs. Cosgrove watched the program that had caused my rather extreme reaction. Well, there’s no reason to get too morbid here. But it was that same feeling again this time with Thorzul, only now the fear wasn’t as abstract as it was the year before. I sat there and worried if I was going to be in trouble, if all the other kids were going to make fun of me for running out of the classroom. But no, my mom finished up her talk with Mrs. Cosgrove, she took me home, and that was it, really. There wasn’t anything to talk about, and nobody in school mentioned it when I came back the next day. Also, we never watched Storylords ever again. So there was that, I didn’t have to sit there and worry every day, that was definitely a relief. Anyway, the only reason I bring this up is because, well, I was just imagining what it’s going to be like when you finally give me a call and ask me to write for Grantland. I thought, what if Bill asks me one of those interview questions, like, “What’s your biggest weakness?” or “Tell me about a situation in which you overcame a great obstacle.” And I thought about this, about the second grade, about Storylords. That story would work for either of those questions. Right? Because I overcame it. Or, I caused a huge scene and got my way. That took initiative. Right? Don’t you want that in an employee? OK, well, that’s it I guess. Give me a call. This entry was posted in Dear Bill Simmons and tagged Bill Simmons, candy, classroom, Dear Bill Simmons, educational videos, full time job, Grantland, jujyfruits, scared, second grade, Storylords, terror, the Sports Guy, Thorzul, TV, writer on April 18, 2014 by Rob G..